Seventy-seven years after the first band was formed, the spirit of the original members of Anacaona is still alive. Today the band’s leaders -sisters Georgina and Dorita Aguirre- maintain the legacy they received from the Castro Zalarriaga sisters. Anacaona was founded in Havana in 1932, by Concepción Castro and her sisters: Ada, Alicia, Algimira, Caridad, Emma, Olga, Ondina and Xiomara. At that time it was considered the first women son sextet; in 1934 they changed the format to Jazz Band and Charanga Típica. Against all the odds -being an all-female band- they embarked on a steady and very successful musical career. They traveled all over Cuba and abroad, sharing international stages with many artists from all over the world. They recorded and appeared as special guests on radio, TV shows and movies. Fifty years later, after finishing their studies at the Amadeo Roldán Conservatory in 1983, Georgina Aguirre and her sister Dorita joined the band, then under the leadership of Alicia Castro (who was the second director of the group). In 1987, the five remaining Castro Zalarriaga sisters decided to retire, and the leadership of the orchestra was passed on and kept in good hands. Since then, Anacaona has been renewed with young and talented girls, graduated from different Art schools and with the required musical talent and charisma to maintain the legendary orchestra. 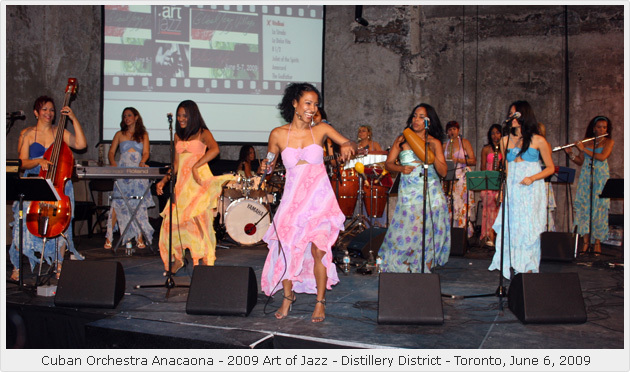 Anacaona made its first Canadian appearance during the Art of Jazz Festival in Toronto, on Saturday June 6, at the Fermenting Cellar venue, in the Distillery District. They also played an outdoor concert at the Trinity stage on Sunday, June 7. It would be great if there were a link to hear the music. Love the photos. Also have an internet radio show and wondered if you thought an interview would be cool? I never knew this website existed. I’m from Indiana, grew-up in Florida and spent over 6 years in Puerto Rico and the islands. I love latin beauties and African beauties as well. It’s something about their cinammon skin. I have a female friend who is much younger than myself and is from Africa. I am going to send this website to Seyi and her little sister Helen. I love world music [specifically, African]. I always loved growing up in the midwest but I am drawn to the Southern Hemisphere and sub-Saharan Africa. I am a Vietnam-era veteran and I have been teaching college. I have a master’s degree in classical geography. Has there ever been an attempt made to hold an international concert at the old Air Force Base in western Puerto Rico? The area is quite large. It is now called Punta Borinquen and is near Aguadilla. The old base [Ramey] has a very long air strip and flight line. I just thought I’d mention it. Thank you for your website. Ja ja!! I don’t look Cuban? they look like me!! Yes Curtis, there is something about that piel canela..no? si. My pic is on my website!